ABAP developers use RSTRANSP program to transport variants of an ABAP report into workbench request to distribute to other SAP systems. 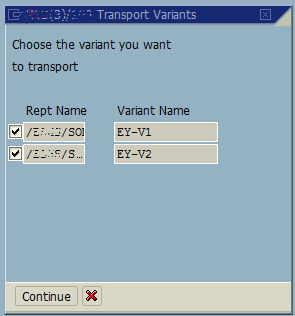 Either by using SE38 SAP transaction for ABAP editor or by executing RSTRANSP ABAP program, programmers can easily filter related program variants and choose for transport request. This ABAP tutorial shows developers how to transport variants of their ABAP reports into transport requests for releasing to other SAP systems. First of all, call ABAP program using SE38 transaction on your development SAP system. Enter the name of the ABAP report and click on Variants button. Transport request menu selection will run ABAP RSTRANSP report which is used to select report and variants for transport request. Programmers can directly run RSTRANSP program instead of calling this utility within the original ABAP program that its variants are to be transported. Enter or check the ABAP program name, or if you want you can enter a list of program names and variant names for filtering on this SAP screen. Run the report by pressing F8. A list of variants that are filtered will be shown on the screen. ABAP programmer can select or unselect the variants displayed with belonging program name. Press Continue for next step where the ABAP developer will choose the workbench request for variant transport or create a new workbench request.